Plan ahead and save with our advance purchase offer. Book 21 days or more in advance and receive 15% off! Guarantee Policy: A prepayment equal to 100% of your total stay is required to confirm your reservation. These reservations are prepaid and non-refundable. Cancellation Policy: These reservations are prepaid and non-refundable. Pet Policy: Pets allowed, Only dogs are allowed | Pet fee: USD 25 per pet, per night fee charged. Two Dog Limit per room. Picuris Jr. Suites at our downtown Santa Fe hotel have two distinct rooms divided by an open archway, with an oversize king bed and a pull out sleeper sofa in the living room. 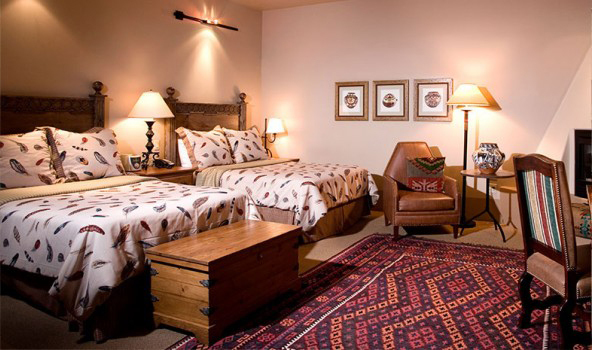 Each suite is furnished with handcrafted Southwestern style natural pine furnishings, granite bathroom counter top, two televisions (one in the bedroom and one in the living room), microwave oven, fully-stocked minibar, in-room safe, WiFi, cozy robes and slippers. 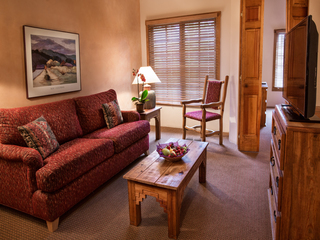 Santa Fe Suites at Hotel Santa Fe are larger than Picuris Jr. Suites. They have two distinct rooms divided by an open archway, with an oversize king bed , and a pull out sleeper sofa in the living room. 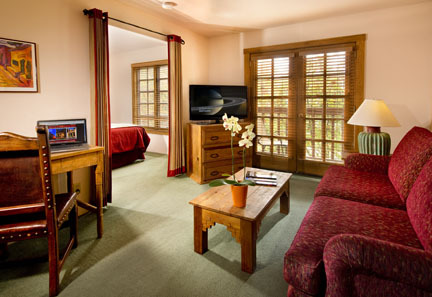 Each suite is furnished with handcrafted Southwestern style natural pine furnishings, granite bathroom counter top, two televisions (one in the bedroom and one in the living room), microwave oven, fully-stocked minibar, in-room safe, WiFi, cozy robes and slippers. Luxury is at its best with the Hacienda Fireplace suite. Each suite captures the spirit of Native American style living while reflecting its elegance and luxury. Impressive Native American artwork and the finest hand crafted and leather furnishings fill the room while adding warmth and comfort. The fireplace Suite comes with a king size bed and includes a iPad/iPod clock radio, wireless internet, humidifier, mini bar, in room safe, coffee maker, hair dryer, plush terry robes and slippers. The separate living room provides a relaxing retreat with pull out sofa sleeper. Guests can take pleasure in the spacious tile and granite bathroom while enjoying double headed walk in showers with upgraded bath amenities. The Hacienda Accessible Fireplace room reflects the elegance and luxury of a beautiful hotel. Our decorative style captures the spirit of Native American. The fireplace room includes two double beds, CD player, wireless internet, humidifier, mini bar, in room safe, coffee maker, hair dryer, plush terry robes and slippers. Guests can take pleasure in the spacious tile and granite bathroom while enjoying double headed walk in showers and upgraded bath amenities.